Soft, low ear pressure plugs are comfortable for a variety of activities. Easy-to-roll foam easily inserts into ear and then expands for a comfortable, custom fit. Noise Reduction Rating (NRR) of 31. Used in applications such as mowing/trimming lawn, power tool use, traffic and office noise or sleeping in noisy rooms. Tested in accordance with ANSI S3.19-1974. Made from a soft rubber material, these plugs are easily cleaned and reused. Neck cord can be removed/replaced easily to accommodate users who prefer to use the plugs without the cord. These plugs come with a convenient carrying case for storage or the case can be attached directly to noise generating devices (eg. the handle of a lawnmower, etc.) to help keep the plugs clean and ready for their next use. Tested in accordance with ANSI S3.19-1974. Self-adjusting foam provides low pressure with attenuation dermatological safe foam non-irritating to the skin. Patented, super soft gel material improves wearer comfort. Easy to insert and remove. High Noise Reduction. Rating (NRR 23). Used to help protect ears against noises at or exceeding 85 decibels; features a fully adjustable headband. Dielectric design for use around electrical hazards. Extremely soft ear pads improve comfort. Noise Reduction Rating (NRR) of 20. Tested in accordance with ANSI S3.19-1974. Used in applications such as mowing/trimming lawn, power tool use, traffic and office noise or sleeping in noisy rooms. Comfortable hearing protection with sliding earmuff caps and an easy to adjust headband; NPR 27dB (noise reducing rating); testing according to ANSI S12.42-2010. Self-adjusting foam provides low pressure with attenuation dermatological safe foam non-irritating to the skin. Soft padded ear cushions for user comfort. Adjustable headband size accommodates wide range of head sizes. High Noise Reduction Rating (NRR 24) helps protect hearing. Folds to compact size to store easily. Reclosable packaging protects during storage. These foldable ear muffs are tested in accordance with ANSI S3.19-1974. Display contains: 100 pair foam ear plugs. Soft, low ear pressure plugs are comfortable for a variety of activities. Foam rolls easily for insertion and once inserted, gently expands to fit ear canal for more comfort while providing protection. Uncorded earplugs seal the ear carnal with soft, slow recovery foam for excellent noise reduction and comfort; sort, pliable foam offers comfort over an extended time; low-pressure foam makes plugs less noticeable; easy to roll down for quick and easy insertions; pillow pack keeps each pair of earplugs clean before use; noise reduction rating (NRR) 33dB CSA Class AL; test compatible with "3M E-A-RFit" Dual-Ear Validation System. Low-pressure plugs for added comfort. 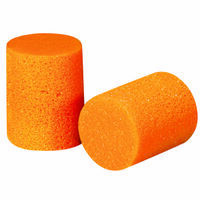 Expandable foam fits wide range of ear canal sizes. Body heat-sensitive foam makes insertion easier. Comes with dispenser box for added convenience. High Noise Reduction Rating (NRR 32).